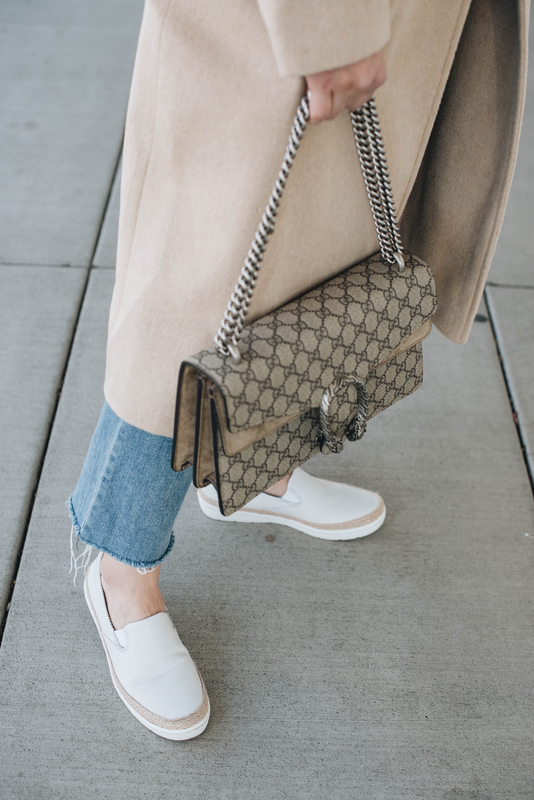 Can you tell, I’m really loving the white sneaker trend? I think I’m making up for lost time, ha! 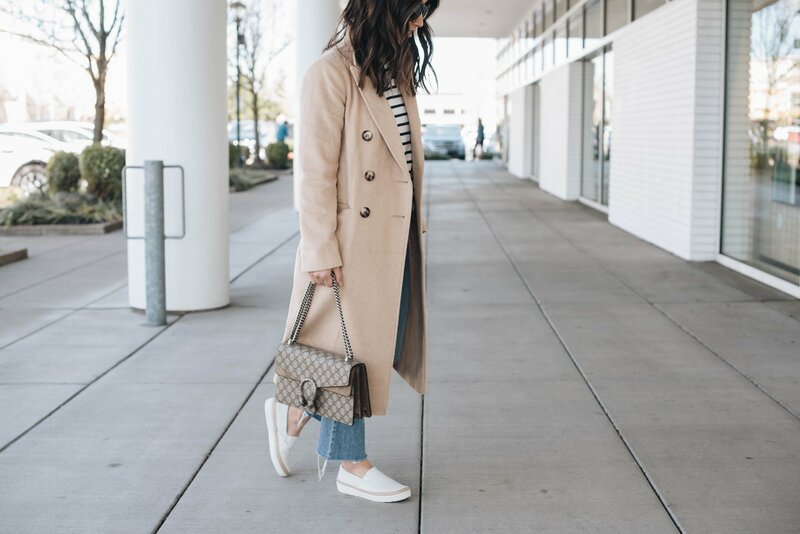 White sneakers truly go with everything and I love pairing them with unexpected outfits. 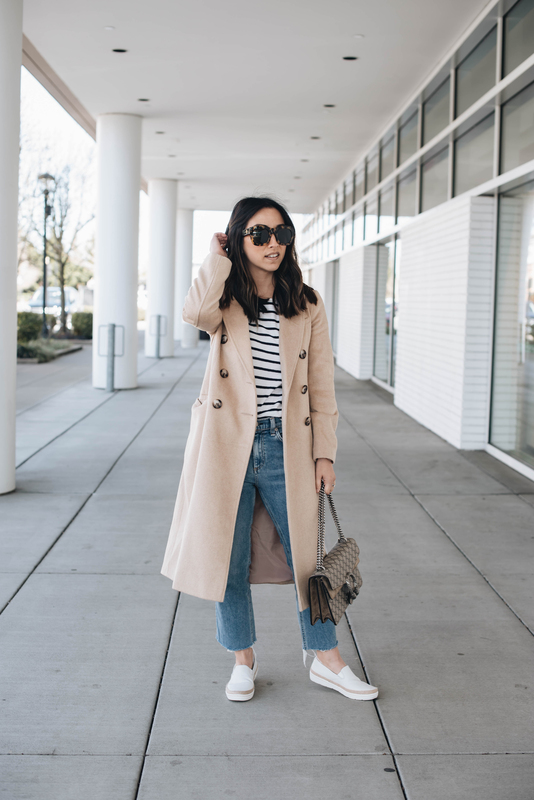 I used to never really wear sneakers with jeans, let alone straight legged jeans, but I just love how they dress down any look and how cool they make easy basics. 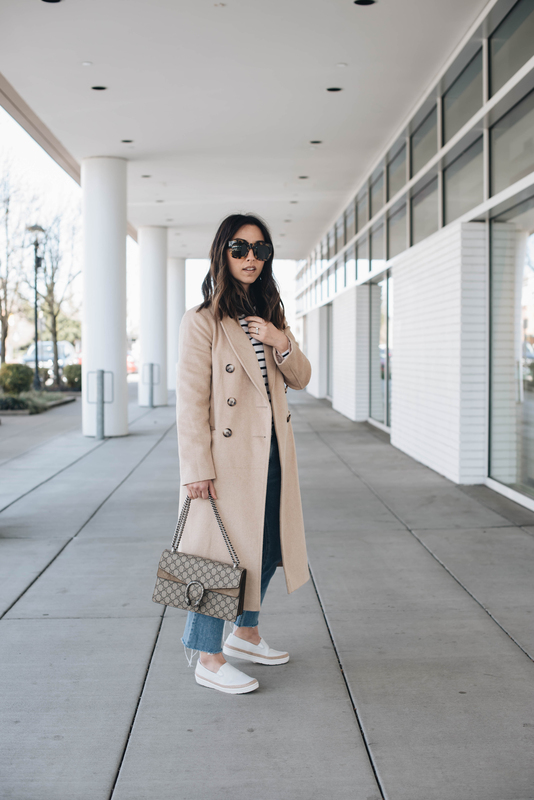 I recently teamed up with Clarks and Zappos to feature Clark’s new spring arrivals. Clarks keeps a sharp eye on trends and style but prioritizes comfort, which I’m all for. I also love that the majority of Clarks shoes come in wide widths, which brings so much versatility to the brand. 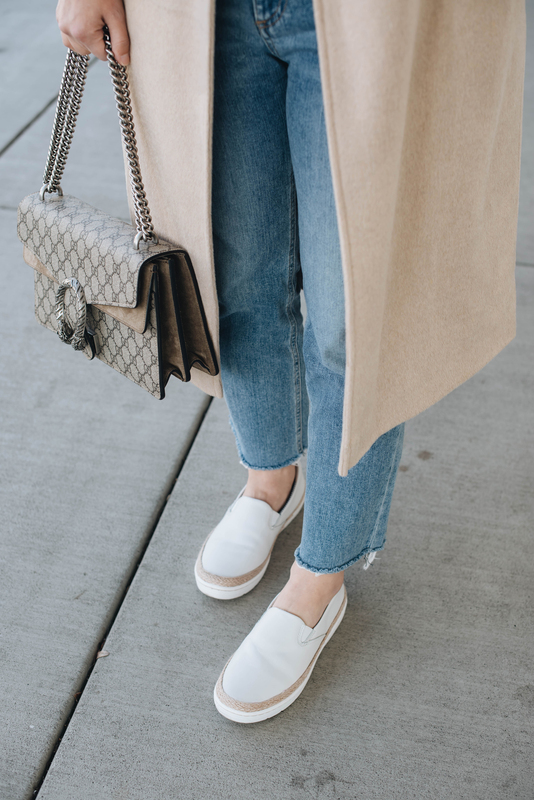 I’m wearing the Clarks Marie Pearl in White Leather and I love how easy they are to wear. The slip on style makes them easy to throw on and the jute trim is perfect for spring and summer. They’re comfortable without sacrificing style, which less face it, aren’t we all looking for shoes like this? You can find the Clarks Marie Pearl at Zappos.com along with the rest of the spring collection. Speaking of Zappos, their next day delivery has been so awesome! I was able to get Harper’s sandals for our LA trip shipped next day for free! The customer service is top notch and a little FYI, their 365 return policy is kind of everything. 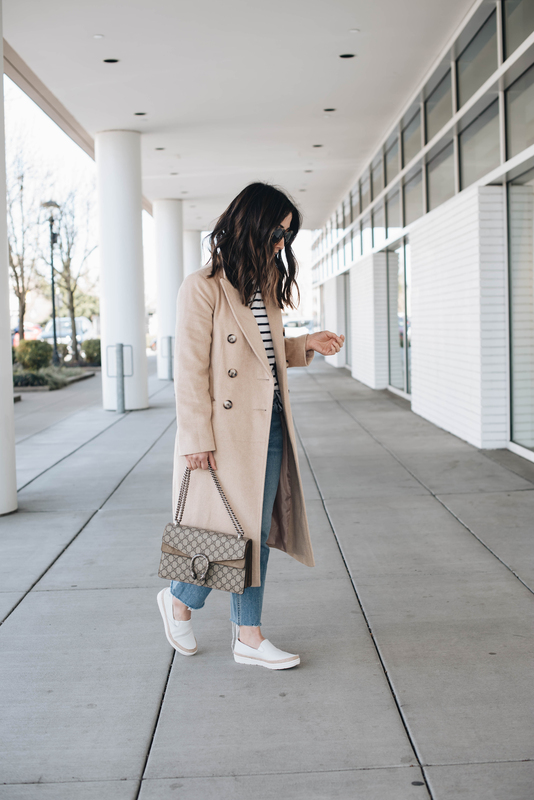 You definitely find the best white sneakers and know how to style them! Awesome to have seen you develop your blog into a full-fledged business over the years. I have made 8 purchases of items based on your recommendations, and all have been well-worn, high quality, and some of my favorite pieces. Also, we checked out the H&M conscious line for our baby because of your blog and those pieces hold up well and have nice designs. Would you consider partnering with a cloth diaper company? We have done cloth diapers for our baby (baby goal brand) and it’s of course eco-friendly as well as a huge money-saver. We use disposable diapers overnight/for travel/etc. but mostly use cloth. Your blog is so influential, it would be awesome to get more people using cloth diapers!